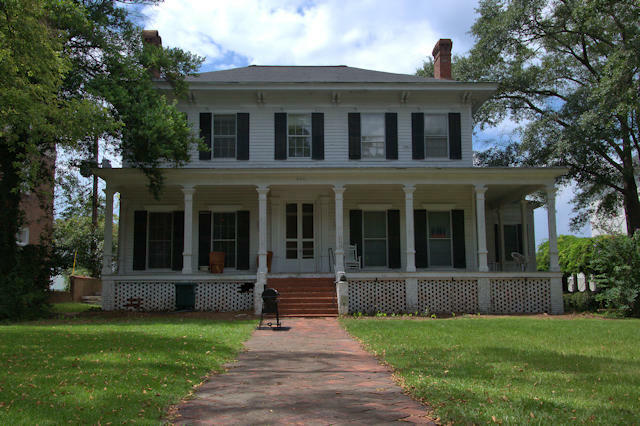 This home, one of the first on College Street, was built by GeorgeTyler Rogers, and early settler of Macon. His son, William Rokenbaugh “Rock” Rogers, lived here after George’s death. This is a beautiful photo of the “Rock Rogers House” but the caption is an error. It was built by his father, George Tyler Rogers, who was an early settler of Macon in the early 1840s and I understand it was the first house on College Hill. The reason I know about this is that George Tyler Rogers was my great-great grandfather, born in Norwich, CT December 3, 1799, and was a merchant. He died July 15, 1869 and is buried in Rose Hill Cemetery. “Rock” Rogers was his son, born May 14 1837 and died October 29, 1908. He lived in the house, along with his mother and children. I do not know the present owners but do remember visiting there as a child. My great-grandfather, Cornelius Decatur Rogers (stayed in Savannah), was a son of George Tyler Rogers and a brother of William Rokernbaugh Rogers, who was too young to build a house in the 1840’s!! Thanks for the background history. I had just noticed my error when I received your comment! Thank you so much for all the pictures of our beautiful Georgia. Great photo–this is a house I admired last time I was in Macon. The architecture suggests a date of 1855-60; it is very similar to two houses in Jasper County that are also from that time period.